Community Video Education Trust (CVET) Archive is a collection of 215 pieces of video footage created by community videographers in Cape Town during the height of popular resistance in the1980s and early 1990s.Users can browse videos by organization, individuals, and genre (demonstrations, interviews, meetings, speeches). The site contains approximately 90 hours of video that has been preserved and made accessible through a partnership between CVET and MSU's MATRIX and African Studies Center. African Activist Archive is a multimedia archive documenting the 50 years of U.S. activists' support for African freedom struggles. The online archive currently contains more than 1500 digital items from more than 75 U.S. organizations, including audio and video, material culture created by organizers (political buttons, posters, and T-shirts), photographs, and documents. Additional materials are welcome, particularly from local organizations. Richard Knight, former staff of the American Committee on Africa and The Africa Fund in New York, is the managing director of this project, which is sponsored by the MSU African Studies Center and MATRIX. African National Congress Film Archive holds approximately 10,000 units of video and film. 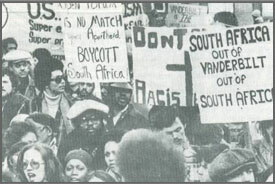 These materials focus on the activities in exile of the ANC, South African Communist Party (SACP), and South African Congress of Trade Unions (SACTU), with videos and films from Zambia, Angola, Lesotho, Botswana, Uganda, and Tanzania (especially the Solomon Mahlangu Freedom College at Mazimbu). The South African Film and Video Project has provided equipment and staff training to the ANC Film Archive to digitize and preserve the videos from exile, and digitizing is underway. African Media Program Database (AMP) With assistance of several South African partners - including Culture, Communication and Media Studies at the University of Kwazulu-Natal, SAFVP has collected information about many video and film productions about South Africa. The project has built a database of more than 14,000 films and videos, including more than 2,600 concerning South Africa and 1,200 concerning other Southern African countries. In addition to basic information about the film or video, some records contain detailed information about the production, synopses of content, recommended audiences, reviews, critiques, and sources for rental or purchase. The database is regularly updated as new information becomes available.